For more details, see the Users Guide. Calcium Reactor Theory and Setup. This is an excellent Regulator/Solenoid for any hobbyist who is automating a calcium reactor or setting up a freshwater planted aquarium. Very quiet, reliable, non-stick operation. Precise needle valve to dispense exactly the flow desired. 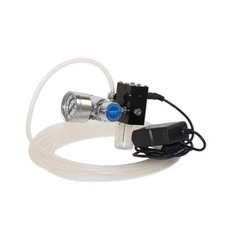 The PINPOINT® CO2 Regulator Solenoid is the Cadillac of regulators.